Original 1982 Swiss GP Race Poster. Shows an artist's impression of Eddie Cheever's Ligier Gitanes JS19 Matra. The race was won by Keke Rosberg in his # 6 Williams FW08 ahead of Alain Prost in his # 15 Renault RE30B and Niki Lauda in his # 8 McLaren MP4-1B. Near mint condition but has been folded (original). The Swiss Grand Prix was only held from 1950 - 1954 at the Bremgarten racetrack and following the huge disaster at Le Mans in June 1955, the authorities in Switzerland banned ALL racing on closed circuits! 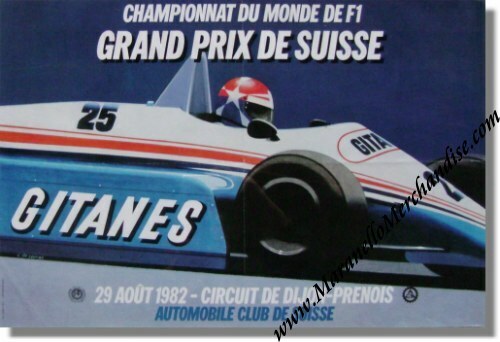 The Swiss Grand Prix was revived for 1982, on August 29, for which this is the official poster and it was held at the Dijon-Prenois racetrack in France. It measures some 23 x 16 inches or 60 x 37.5 cm.